We send our greetings to you at this challenging time. It is a time that calls those who can be both advocates and healers. As we fight to change the system that continues to dump this pollution into the air, we also stand with those who are recovering and rebuilding from the impacts. As we join with those who resist corrupt policies and abuse of power, we also seek to understand the painful divisions and persistent illusions in our civic life. 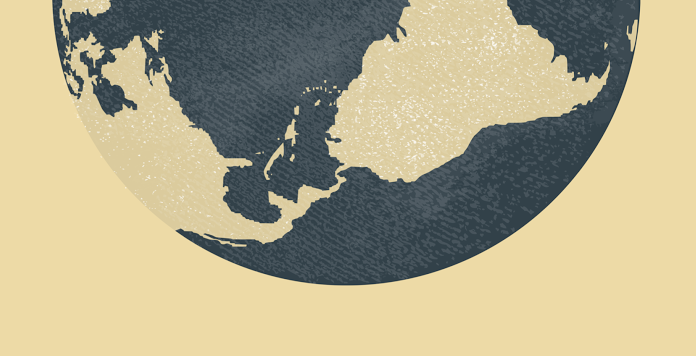 This semester, The Center for Earth Ethics is initiating a new time of serious inquiry as individuals, as collaborators and as leaders in an ever-changing landscape, geographically and politically. Our goal is to address the root cause of climate change—an economic development model based on short-term profit, no matter what the cost to people and planet. We envision a world in which value is measured according to the long-term well being of the whole. We believe that this value system can be achieved through a combination of the restoration of older traditional ways and the inclusive, equitable application of new technologies. Thank you for being a part of our work. 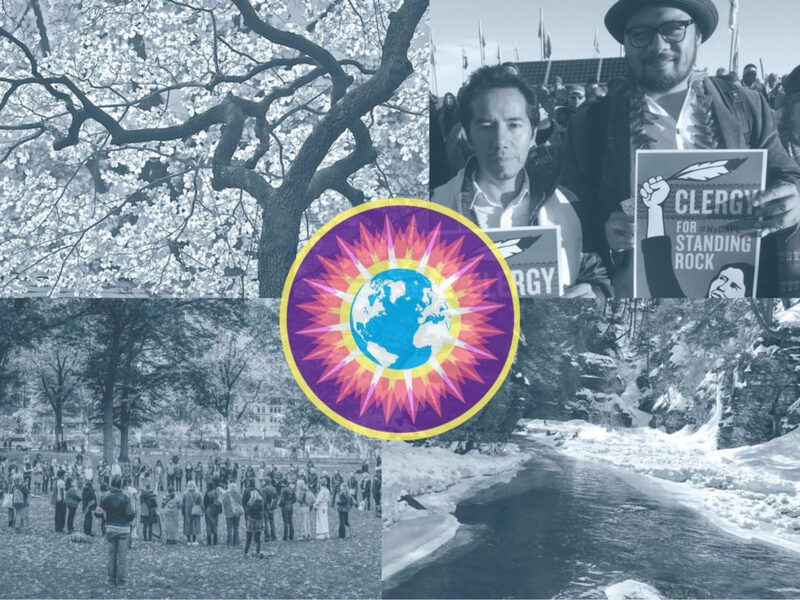 We invite you to learn more about each of our four program areas– Original Caretakers, Environmental Justice and Civic Engagement, Sustainability and Global Affairs and Eco-Ministry—and to be in touch with us about the work you are doing in your community. Please also follow us on social media and feel free to come to the gatherings at Union. There’s so much going on already this Fall, and we’ve only just begun! Rev. Leo Woodbury speaks to Global South Summit participants outside the UN Church Center. 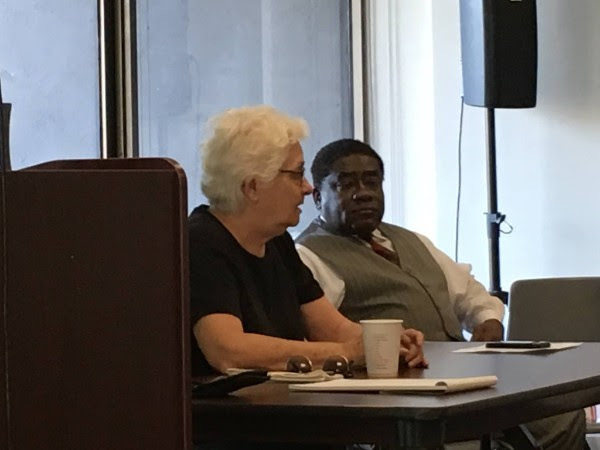 On September 15th, the Center for Earth Ethics teamed up with Rev. 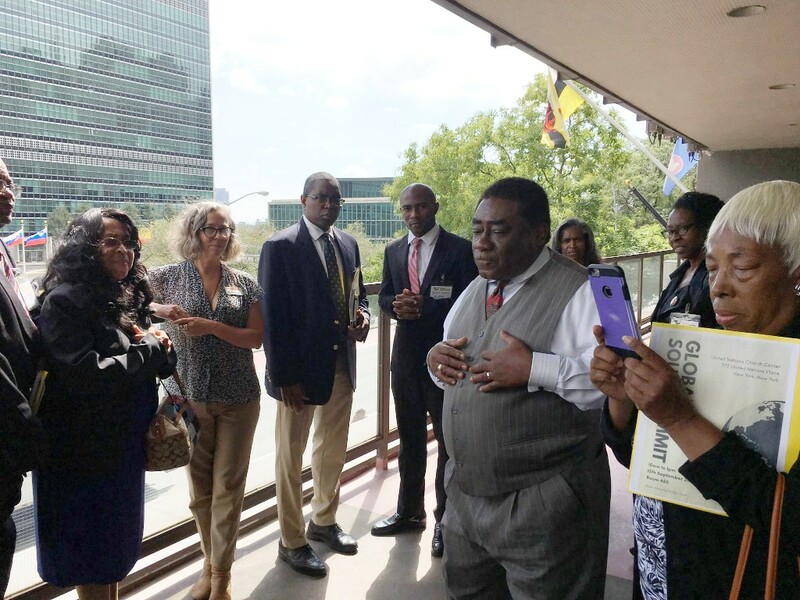 Leo Woodbury of Kingdom Living Temple to host the Global South Summit in New York City at the UN Church Center. 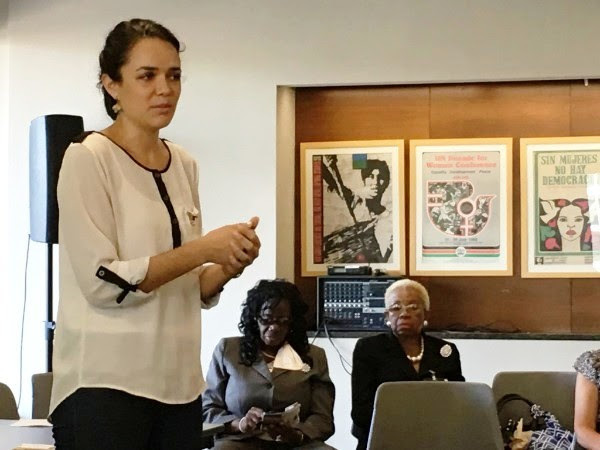 Participants came from North Carolina, South Carolina, New York, and New Jersey, as well as, Global South representatives of Mexico, El Salvador and Nigeria to join forces tackling the problems of Climate Change. The Summit served to bring allies together, sharing our various insights and information, thereby strengthening our potential impact through partnership. This shared space helps bring our local communities and constituents forward towards clean air and clean water by providing new educational platforms that serve those goals. 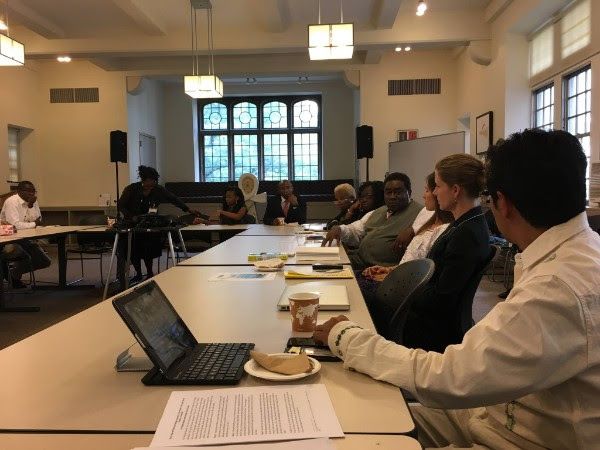 After a rich morning session which included talks by (clockwise from top left) Green Faith Organizer Estrella Sainburg, Dogwood Alliance’s Danna Smith, International Adviser Marta Benavides and CEE’s Mindahi Bastida, participants reconvened at Union Theological Seminary for discussion. How do we bring NGO’s together? Do we all have the same goals? (NGO’s, Communities, Faith groups, Environmentalists, Original Peoples?) How can we determine if NGO’s share our common goal to reconnect people to the Earth? What principles can we apply from First Nations’ wisdom? 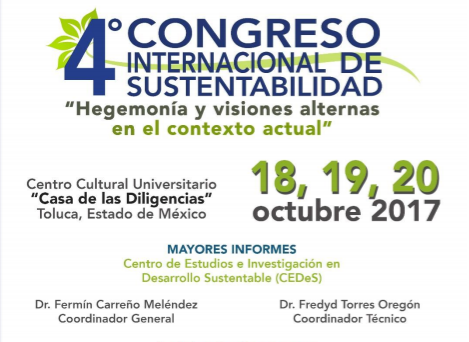 How do we measure Sustainability? What is Our Vision of the Future? How do we make a Just Transition? What are the current funding sources to assist communities transitioning to renewable energy sources? How can pastors apply this information to their congregations? Many thanks to Rev. Leo Woodbury and the entire team at Kingdom Living Temple for opening the door to meaningful partnerships. We need to work together to move our society away from poverty and division, and into a vision of the future where people and planet come first. 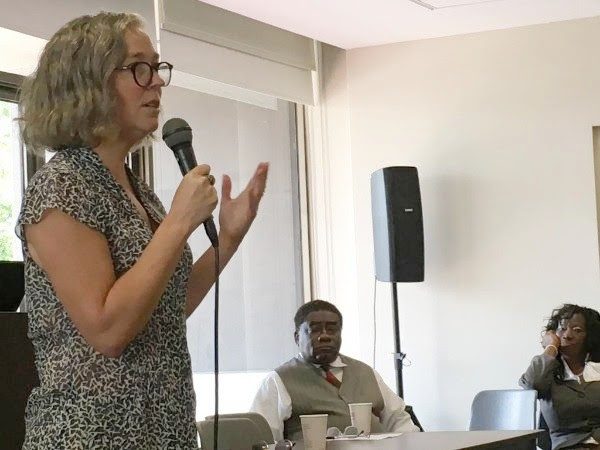 CEE’s Director of Environmental Justice and Civic Engagement, Catherine Coleman Flowers, made groundbreaking news this month as a long awaited study from Baylor School of Medicine was released exposing the rise of hookworm and other tropical diseases in the US South. 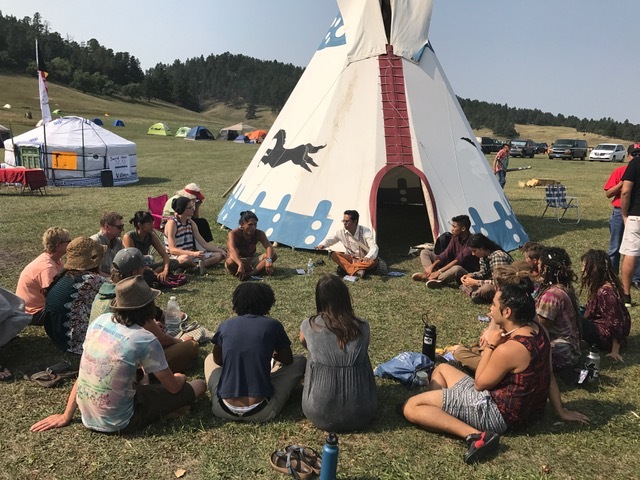 Center for Earth Ethics Original Caretakers Program Director, Mindahi Bastida, sharing about Bio-Cultural Heritage and Sacred Sites in a workshop at the 2017 UNITY Concert in the sacred Black Hills. 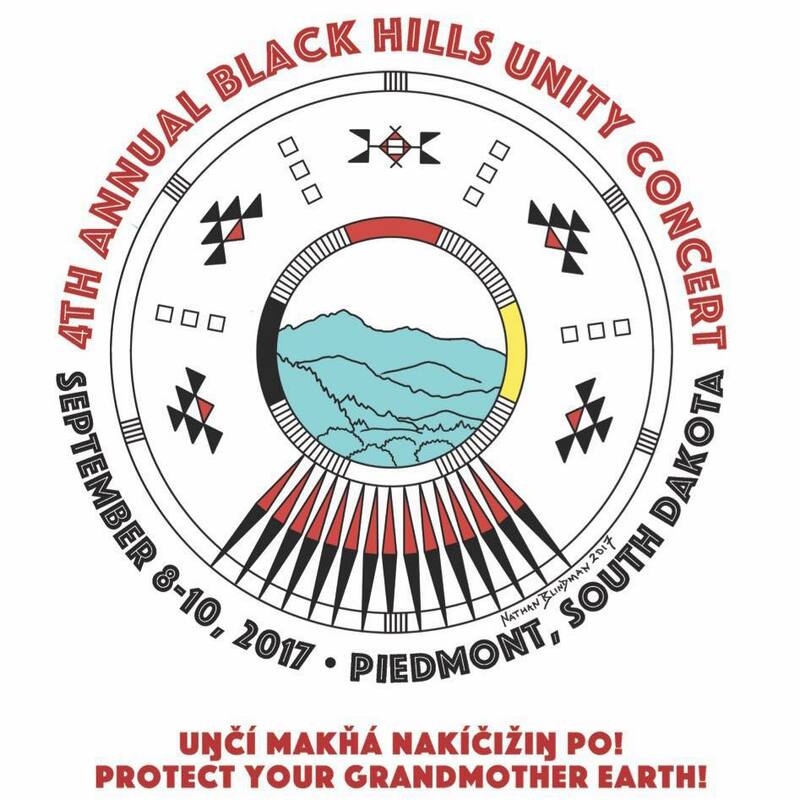 The Center for Earth Ethics was proud to participate in the 4th Annual UNITY Concert held in the Black Hills of South Dakota. CEE Fellow, Lyla June Johnston has served as both organizer for the UNITY Concert in 2015 and 2017, and performer since its inception. This year, the Center for Earth Ethics was invited to participate with opportunities to address the main stage crowd, and by leading a workshop on the Center’s programming facilitated by Mindahi Bastida, CEE Original Caretakers, Program Director. 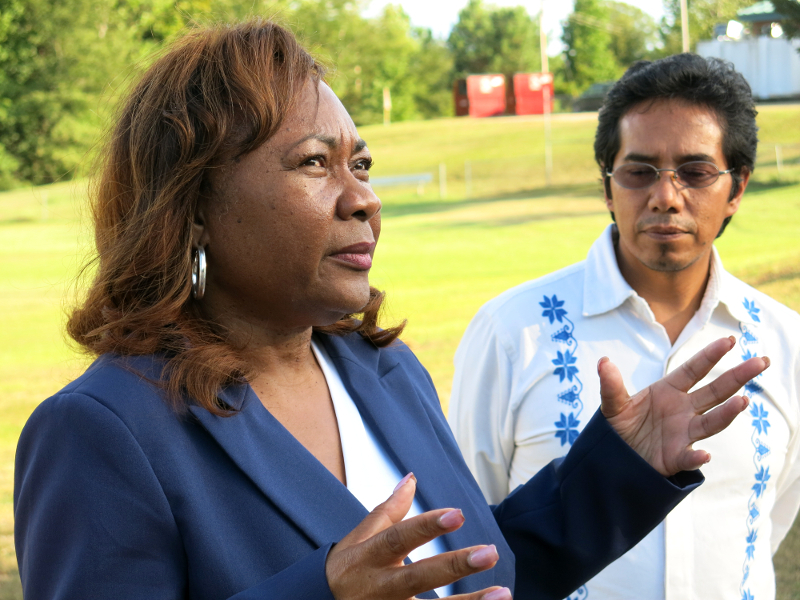 The session focused on the importance of protecting sacred sites, such as the Black Hills. Mr. Bastida explains the value of protecting these sites, by understanding Bio-Cultural Heritage: a complex system of the relationship between Indigenous Peoples and their natural environment including long standing traditions, practices and knowledge of sustainable use of biodiversity. During the weekend gathering, Mr. Bastida also participated in the creation of the Indigenous Peoples’ Alliance to protect Sacred Sites. A Proclamation of Alliance and Solidarity regarding the UN Declaration of Indigenous Peoples’ Rights was produced by the group with 29 signatories including Lakota elders and other original peoples’ spiritual leaders from the US, South America, Mexico, Tibet and Australia. This year marks the completion of a four year cycle and the transmission of wisdom from elders to youth. Lyla June Johnston, helped guide the vision of UNITY with a prayer of inclusiveness for people of all nations. 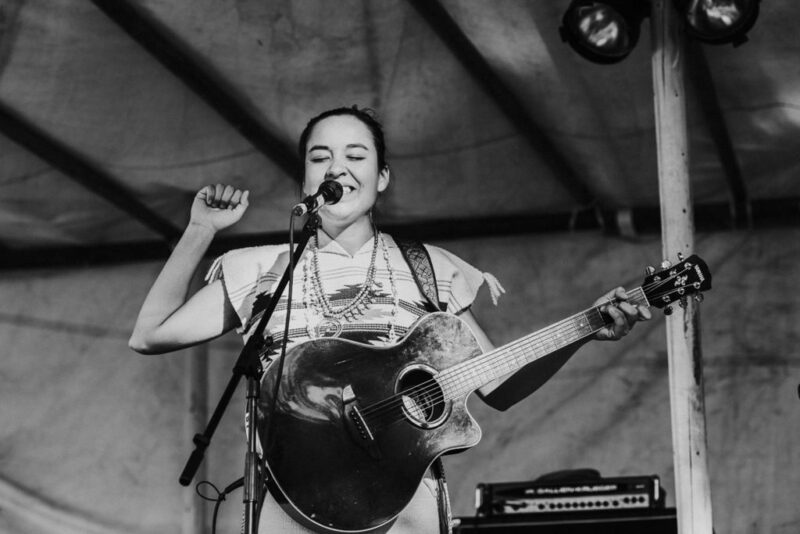 Lyla June Johnston: CEE Fellow, poet, musician and organizer of the UNITY Concert. 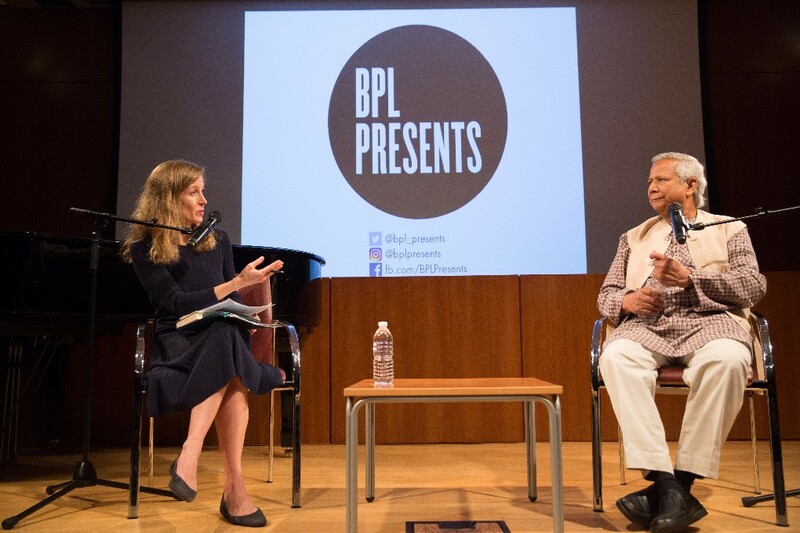 On September 27th, CEE Director, Karenna Gore engaged in a conversation at the Brooklyn Public Library with Muhammad Yunus about his new book A World of Three Zeros: The New Economics of Zero Poverty, Zero Unemployment and Zero Net Carbon Emissions. The conversation covered topics such as technology, social business, economic measurements, gender, and capitalism, as well as the impacts of climate change in Bangladesh and the plight of the Rohingya Muslims fleeing Myanmar. There is real fear in people across the planet that their children and their children’s children will not have much of a planet to inherit. This is not a fear based in an apocalyptic eschatology or rooted in a theology of end times. It is a fear based on bar graphs that track increased levels of CO2 that lead to higher global temperatures that are becoming less and less palatable to living and life. Mindahi has also been working with UNESCO to get formal status for Sacred Sites around the globe. If this status is granted it would bring new measures and rules to help Indigenous People’s protect Sacred Spaces from being developed or lost to mining or agriculture. 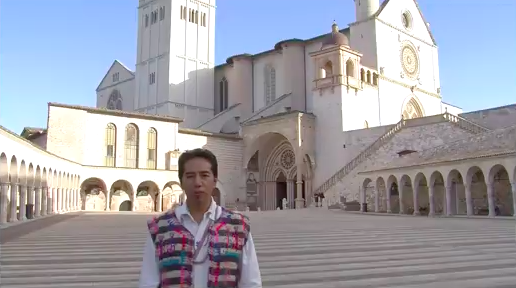 We hope Pope Francis listens to our appeal and joins in the fight to protect Sacred Places around the globe. Last June several CEE staff traveled to Rome and Assisi to take part in the Rome/Assisi Conference on Spirituality and Sustainability. CEE was one of the conveners along with Center for Ethics. Part of that dialogue included speaking truth about the role the Catholic Church played in the genocide of Indigenous People’s throughout the Americas and the erasure of their culture, religion, and traditions. The Papal Bull of 1493, and the Doctrine of Discovery which grew out of it, gave clemency to and encouraged Christopher Columbus and all subsequent explorers to the Americas to subdue, kill, and enslave any pagans and natives they met along the way. 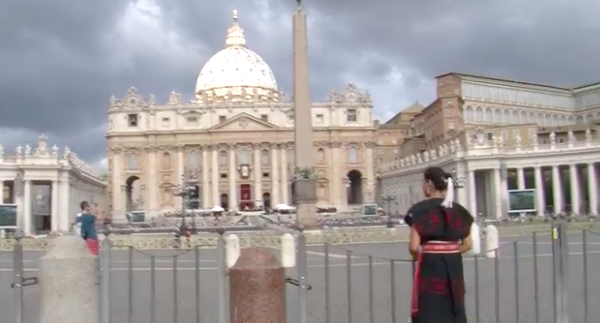 While in Rome, CEE Fellow Lyla June Johnston delivered a message to Pope Francis, asking him to rescind the Doctrine of Discovery.